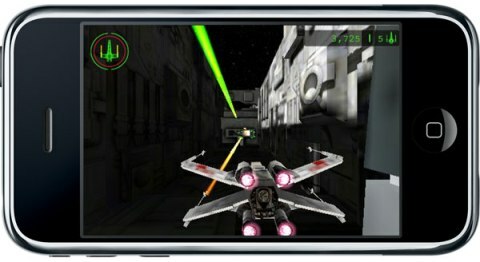 The worldwide market leader in mobile entertainment, THQ Wireless Inc. has released Star Wars: Trench Run game for iPhone. It’s the game developed by the leading studio – Infrared5, enabling players to take control of an X-Wing fighter and battle against the dark side, delivering a breathtaking 3D experience based on the original Star Wars movie. Force Power – Slow down time and increase agility to bring TIE fighters into shooting range, and to dodge obstacles while flying down the trench. Hidden Features – Players are just going to have to find out what these are. Amazing Special Effects – Including lighting, advanced shaders, explosions and incredible lifelike models. Original Music and Sound Effects – Combined with real movie footage for complete immersion into the Star Wars universe. True-Life Flight – Accelerometer controls with life-like physics. Addictive Game Play – Ever increasing challenges, and tons of replay value. Multiple Points of View – Featuring both chase cam and cockpit modes. Mission Mode – With story board, music and dialogue from the original Star Wars movie. Arcade Modes – For increased re-playability, includes both Trench Run and Dog Fighting modes. Leader Boards – Players compete against others across the world for the top spot. Find out who are the true Jedi. Optimized Gaming Experience – To work on the 3G, with special graphical features for the 3GS, iPod Touch 2nd Gen and future devices. Star Wars: Trench Run game with multiple difficulty levels (from easy to jedi) is now available for download via iTunes for $4.99.